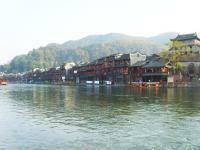 Fenghuang means phoenix in Chinese. 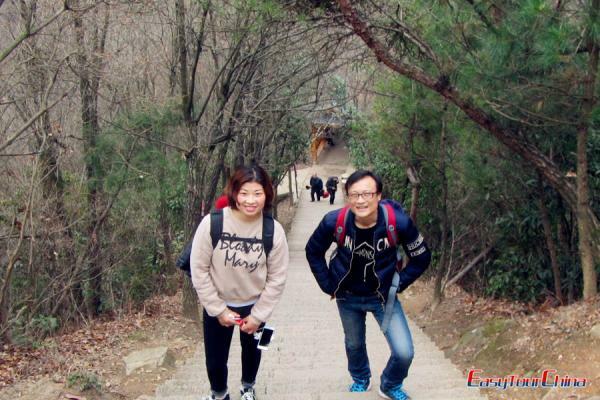 In Chinese culture, the male one is called Feng, and the female called Huang. 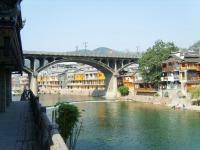 According to the legend, some phoenixes flew over this small city and were so absorbed by its beauty, so they were reluctant to leave and stay here permanently, hence, the name - Phoenix Town or Fenghuang Town. 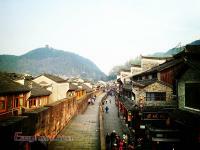 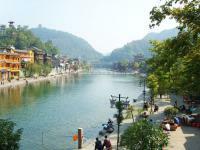 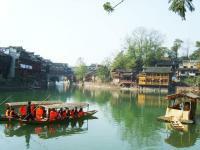 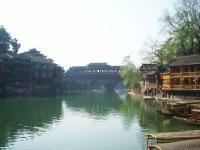 Located in the west of Hunan province, Fenghuang consists of 9 towns, 22 counties and 344 administrative villages. 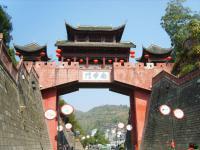 The old city wall was first built around 1704 with east and north gates still erected. 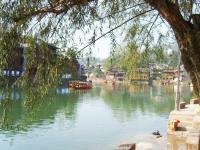 The peaceful Tui River flows across the small town, you can see quite a number of wooden cabins were built half suspended over the river, people usually call them ‘Diaojiaolou’. 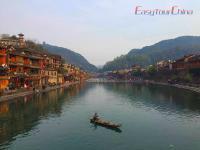 Fenghuang is the home to minority ethnic groups, mainly Miao and Tujia nationalities. 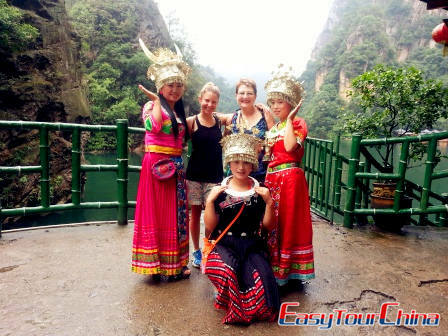 The batik and tie-dye are very popular among the minorities here. 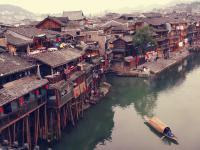 Miao and Tujia have their own ways to produce the cloth with unique folk patterns. 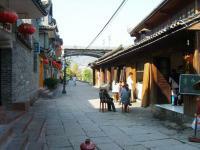 Beside, they also make embroidery (Tujia), silverware (miao) and paper cut. 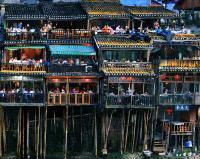 The gingier candy is also a well-known specialty in Fenghuang. 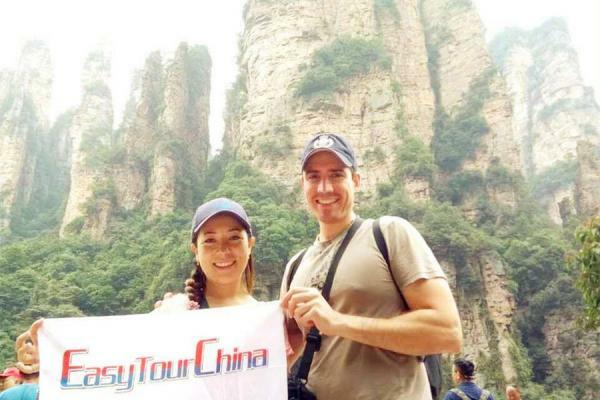 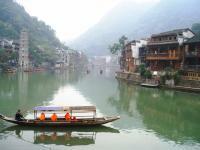 The major attractions in Fenghuang includes cruise at Tui River, East Gate of Fenghuang, the Residence of Mr. Shen Cong-wen, Southern Great Wall built in Ming Dynasty and Qiliang Cave. 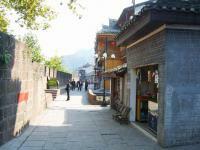 Besides, the small town gives birth to several celebrities, such as, the famous writer - Sheng Cong-wen and the painter-Huang Yongyu. 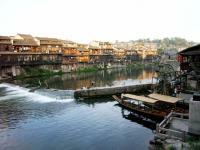 Fenghuang has distinct four seasons and mild temperature, with average annual temperature 15.9℃ and average annual rainfall 1308mm. 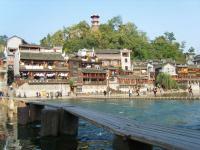 The hottest July is around 24-27℃, which in January is around 1.7-4.3℃ (average).